Pam Smith lives a charmed life as a well-to-do Babylon, N.Y., homemaker in a large house by the water. In her 50s with her children grown, Pam is happy with her exemplary husband Jack. After he has a heart attack on the subway, however, she finds out more than she ever wanted to know about Jack. Pam must confront a series of revelations that unmask a life she realizes she only thought she knew, and the losses and disappointments she discovers give color and understanding to a man markedly different than he appeared. Uncovering secrets and betrayals far worse than her most vivid nightmare, Pam retreats to their meticulous Babylon beach house, the one refuge she has to put the pieces of her life together and move toward ultimate forgiveness. This book has a lot of emotion. Lots of highs and lows and everything in between. I thought this book was very good. It was well written and the characters were full of emotion and very real. Although I had a hard time with some of the decisions Pam made, I felt myself being drawn to her because of everything she was going through, and loved seeing her survival mode kick in. It’s a very gripping story, with suspence, deceit, loss, hope and life changes. It’s got a mystery about it so that you can’t stop reading, you have to know what’s going to happen next. Even the characters you don’t particularly like in the beginning grow on you, and by the time you’ve read the last page you want more of all of them. Luckily, this is the first book in the series, so you can read more, which is a very good thing considering how the book ends. I was lucky enough to also have the next two books in the series sent to me for review, and will be posting my thoughts about them later this month. Suzanne Jenkins lives in the west Michigan lakeshore area with her husband, two dogs and two sheep. 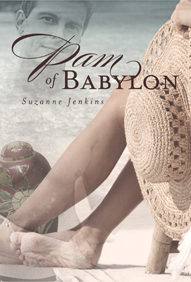 To learn more about Suzanne, author of Pam of Babylon and other stories, visit her blog. What a lovely sensitive review and you obviously enjoyed the book. I was getting well into the story there and seriously considering adding them to my list, then you intimated that the ending wasn’t conclusive and that I would need to read the rest of the series to get some kind of closure? That turned me off then, I’m afraid. I don’t typically enjoy series books for the simple reason that the chances of me ever reading and finishing one in order, aren’t very high at all. I don’t mind a series of books featuring the same characters, but I like each book to have a definitive ending, so that they can be read as stand-alones. I am glad that you clearly enjoyed the book and hope that the rest of the series is just as good. I love books that reveal secrets gradually. Sounds like a great series.